48 Restyling & tRuck AccessoRies | May 2015 restylingmag.com number for an employer is easier said than done. "The employer man- date has been the hardest part of the law for businesses to understand," says Solander. "Determining who is a full time employee, for example, by reviewing the hours they have worked has been a challenge." For help in calculating your own FTE, go to healthcare.gov/shop-calculators- fte. Business owners may also want to consult with their accountant. Solander cautions against instituting a program that gives employees after- tax payments that they are told to use to purchase insurance on the open market, including the state individual exchanges. Such arrangements —sometimes called Employer Payment Plans, or Pre- mium Reimbursement Arrangements —are deemed group health plans and are considered insufficient to satisfy the ACA's minimum requirements for coverage. Because they violate the ACA, they can trigger fines of $100 per day (or $36,000 per year) per employee. Note that even businesses which have 50 or fewer FTEs, and which are there- fore not subject to the employer man- date, should not engage in this kind of reimbursement program. Doing so may subject them to fines, because any health insurance program offered by any employer must satisfy ACA min- imum requirements. An alternative and legitimate arrange- ment is to increase the salary of employees with the idea that they can—but are not required—to use their additional income to buy their own insurance. Such an increase, though, would be subject to payroll taxes. (Additionally, businesses with 100 or more FTEs, and for that reason are subject to the employer man- date, would incur penalties because the increased salary on its own does not con- stitute health insurance coverage). 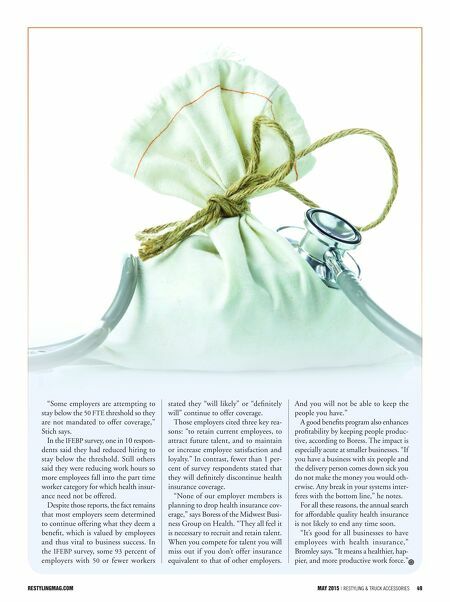 Prime Benefit If the costs and complexities of an employer-provided health insurance program seem more than the benefit is worth, opting out is a possibility. 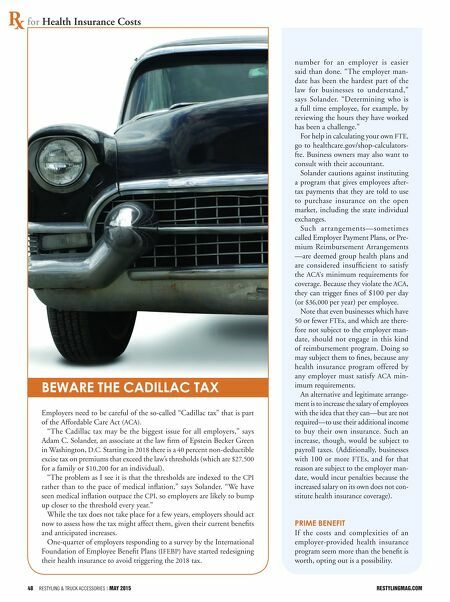 for Health Insurance Costs Beware the CadillaC tax Employers need to be careful of the so-called "Cadillac tax" that is part of the Affordable Care Act (ACA). "The Cadillac tax may be the biggest issue for all employers," says Adam C. Solander, an associate at the law firm of Epstein Becker Green in Washington, D.C. Starting in 2018 there is a 40 percent non-deductible excise tax on premiums that exceed the law's thresholds (which are $27,500 for a family or $10,200 for an individual). "The problem as I see it is that the thresholds are indexed to the CPI rather than to the pace of medical inflation," says Solander. "We have seen medical inflation outpace the CPI, so employers are likely to bump up closer to the threshold every year." While the tax does not take place for a few years, employers should act now to assess how the tax might affect them, given their current benefits and anticipated increases. One-quarter of employers responding to a survey by the International Foundation of Employee Benefit Plans (IFEBP) have started redesigning their health insurance to avoid triggering the 2018 tax.